Robert W. (Bob) Reynolds was born in 1945 in Jackson Hole, Wyoming, where his parents had been snowed in at the south entrance of Yellowstone National Park (NP). Baptized in Grand Teton’s Chapel of the Transfiguration, he finally made it to the top of the Grand Teton 50 years later. In the meantime, he grew up in Yellowstone, Theodore Roosevelt National Memorial (now Park), and Pipestone National Monument. He lived in Omaha for four years before attending Phillips Exeter Academy, Montana State University, and the University of Nebraska, receiving a degree in zoology. Along the way he pumped gas, worked on blister rust control, was a garbage man and janitor, and he manned a fire lookout before joining the Army, becoming a Russian language expert fighting the Cold War in Germany listening in on Russian army troop movements and then selling furniture and garden equipment back home. With this varied background, he joined the National Park Service (NPS) in its Eastern Service Center as an ecologist in 1971 and soon began a career as interpreter and park manager. He worked as interpreter in the Pacific Northwest Regional Office, San Juan Islands, and Craters of the Moon, before becoming chief interpreter at Capitol Reef. After participating in the Interior department’s management development program in 1979, his career as a “go to guy” for solving problems in parks took off. 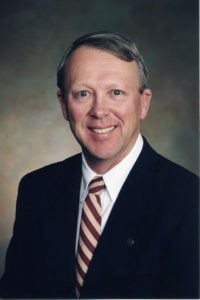 During the next twenty years he would serve as superintendent of eleven units and develop a reputation for successfully taking on difficult and/or controversial issues that threatened park resources. These issues ranged from orchard management and grazing at Capitol Reef, creating a partnership to rehabilitate Acadia’s storied carriage roads and preserving the 5,000 acres of the largest undeveloped island along the east coast, leading creation of the national superintendency course, and moving the Cape Hatteras Light House. One career highlight was at Mount Rushmore National Memorial when the American Indian Movement threatened to blow off George Washington’s nose. Sitting at his desk one day, Bob looked up to see a tall American Indian with braided hair standing across the desk who then shot out his hand and said, “Hi. My name is Gerrard Baker, and I am here to save you from the Indians.” Gerrard was the head of the law enforcement team that had been sent to the park. Bob was a beloved and respected leader, a “ranger’s ranger.” He was a good listener and sensitive to local, national and Congressional relationships. He was regularly called upon to represent the NPS with complex, sensitive issues in often potentially volatile settings, helping participants find common ground. He worked for solutions based in NPS policy yet being sensitive to local conditions. A reflection of that ability was when he was chosen to provide expertise in park management on an international team assessing threats and proposing operational changes and legislative needs for Ecuador to continue to provide protection to the Galapagos World Heritage designation. His sensitivity and expertise resulted in legislative and operational changes that would continue to protect the international significance of the Galapagos Islands. Following his retirement in 1999, he reached what he called true success: regularly walking his dog, playing with grandchildren, and consulting. Though the dog is now gone, the grandkids are still a priority and his constant willingness to help and contribute led him to teaching at Albright and Mather centers, serving on the boards of Eastern National, the Northwest Interpretive Association and the Employees and Alumni Association, census taking in for the 2000 census, consulting at Petra in Jordan on reorganizing their park operations, and working on the Lewis and Clark Bicentennial, among other things. He then spent ten years with Oregon State University Extension revitalizing the educational efforts of the master gardener programs of two counties in Oregon, as well as curating his extensive collection of hedgehogs (no living ones) while downsizing in Medford, Oregon.